An interactive "E3 Floor Plan" published by GameSpot seems to indicate that both Dragon Age II and Mass Effect 3 will be at the show. Oh, and Tecmo's Dead or Alive 5, too. 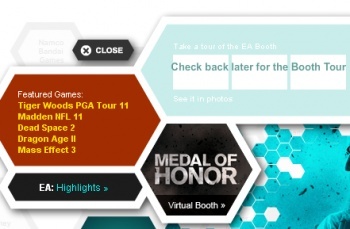 Gaming site GameSpot has a pretty nifty E3 Showfloor Map up on its site to mercilessly tease and torment those of us who aren't going to the show this year. Click on the name of the publisher or developer, and you'll get to see what they'll be boasting at the event. If you click on the EA booth, however, you may notice two games that haven't actually been officially unveiled yet, both from EA's BioWare division: Mass Effect 3 and Dragon Age II. This isn't to say that we didn't know that the two games were coming - an early 2011 arrival for something Dragon Age-related was teased back in March, and Mass Effect was planned as a trilogy from the get-go. But if true, this is the first time we'll see the two games in action. Which will be pretty cool, don't you think? It seems that BioWare has been busy up in its doom fortress buried beneath the frozen wastelands of Canada. Now, none of this is confirmed until E3 starts next week: This could be a mistake in data entry on the part of GameSpot, or perhaps just a very educated guess. However, assuming that GameSpot has inside data and this is real (which again is by no means assured), there's at least one other brand-new game on that list: Tecmo's Dead or Alive 5. One wonders how the series will shape up following creator Itagaki's highly publicized departure from Team Ninja - my guess? It'll be as bouncy as ever. Oh, and the map also lists Final Fantasy Versus XIII at the Square-Enix booth - which might answer the question of whether the game will make a long-awaited appearance at this year's show. Then again, it might not. Curiouser and curiouser indeed. I wonder what other surprises next week has in store. Update: Someone took it down. Whether that's a "whoops, we weren't supposed to reveal that" or "whoops, we were wrong/guessing and we got found out" is up to you.